By appealing to the impossibility of an infinite regress of natural numbers, his demonstration takes the form of a reductio ad absurdum. This proof greatly enriches our understanding of the world of numbers. The Definitions which begin Book VII set forth the objects which inhabit the cosmos being set forth. Definitions 11 & 13 describe the mutually exclusive ‘prime’ and ‘composite’ numbers which, other than the unit, account for the entirety of the universe. Proposition 31 takes a single but significant step further. It sets a foundation which will help demonstrate that every number is either prime or composite, but even more radically, it establishes that every composite number has a prime factor. Prime and composite numbers are not simply two kinds of numbers. Rather, prime numbers have a certain kind of precedence which accounts for their name (‘prime’ meaning ‘first’). But in what sense are prime number first (or prior) to composite numbers? They are first in at least three ways. In the ordinal sense, they are first. Two and three (primes) come before four (a composite). Five comes before six, seven before eight. This is not to say that every prime is before every composite, but, if every composite number has a prime factor, than every composite must have a prime forerunner. As the classic elements of antiquity are to the creation, so too are the primes to the composite numbers. The great difference is only in their unlimited quantity. The cosmos of the mathematical world is an imputed one–an infinity in potentia. Thus it has neither finite objects nor finite elements. New elements (or in the modern sense, members of the Periodic Table) are forever being discovered. In the same way, the members of the Periodic Table of Elements can be viewed as the building blocks of creation, so too can we consider prime numbers. This does not mean that one cannot reduce further. Hydrogen can be reduced to an atom which can be reduced to a quark, etc. 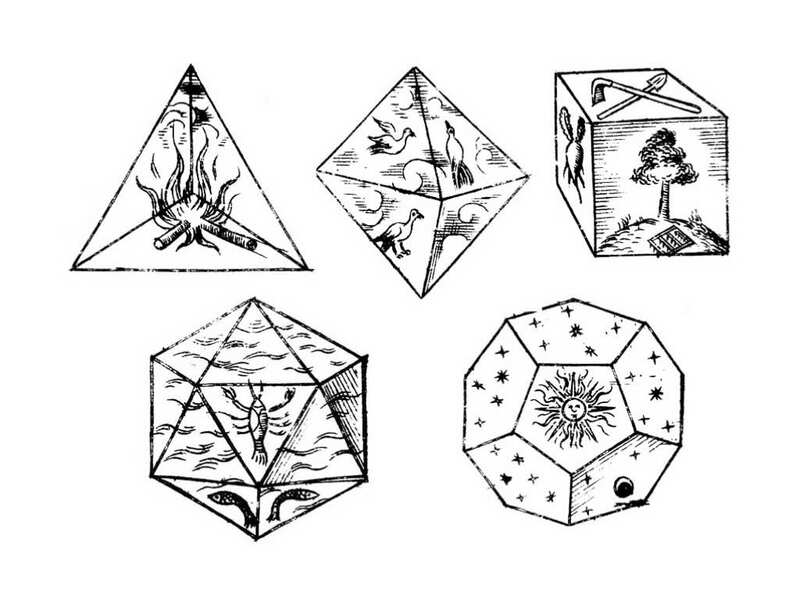 For Plato, fire, air, earth, and water could all be reduced into triangles. This possibility of reduction supplied the potential of motion and change. But the principle elements were yet believed to be the structures out of which all beings were constructed (things are made from molecules and not atoms in isolation? ), Composites are structured out of primes, and objects for Plato and the Medieval Philosophers out of earth, air, fire, and water. Thus, we can reduce the number 9 further than its prime factor, three (fire into a triangle, Hydrogen into a electron). But the moment we make such a reduction, it has ceased to be a number and has been returned to a unit. We are no longer numbering in the primary sense. This is the significance of proposition 31. Prime numbers are not only first on the ‘number line’ and first because they are the factors of all composite numbers. They are first in their nature as the boundary between all numbers and the unit (that upon which numbering depends, but is itself not a number). If the unit is categorically different than all numbers, primes mark-off the border. By definition, primes have no other factors and so cannot be divided without a decomposition back into the unit. The primes, the boundary between the one and many, are that out of which all the many (including the composites) are constructed. Proposition 31 is founded upon, not only the impossibility of an infinite regress of natural numbers, but upon the demarcation of unit from number. A demarcation which is stressed and accented by the nature of the primes. What is encountered in prop. 31 is in fact the relationship between the one and many. It demonstrates that the transition from and relationship between the one and the many is mysterious, complex, and orderly, one in which differentiation and hierarchy play a fundamental role. Such a relationship is marked by structures of difference, of same and other. The journey through the one and many institutes iterations of unity in new patterns and senses. It is unity which governs and orders the meaning and nature of all number. And it is Unity that the primes express in their own unique or primal manner. The One is re-presented and reconstituted in the many, in the world of numbers, in such a manner that every number will display a certain mark or participation in unity, even while some display this character in a greater or primary sense. Euclid’s proof is logically elegant, historically significant, and theoretically intriguing. Eclipsed by the proof of the infinitude of primes (Book IX, proposition 20), this proposition sets forth something equally fundamental for mathematics. It demonstrates part of the number world’s peculiar order, elegance, and mysterious participation in unity. Let A be a composite number. I say that A is measured by some prime number. Since A is composite, therefore some number B measures it. Now, if B is prime, then that which was proposed is done. But if it is composite, some number measures it. Let a number C measure it. Then, since C measures B, and B measures A, therefore C also measures A. And, if C is prime, then that which was proposed is done. But if it is composite, some number measures it. Thus, if the investigation is continued in this way, then some prime number will be found which measures the number before it, which also measures A. If it is not found, then an infinite sequence of numbers measures the number A, each of which is less than the other, which is impossible in numbers. Therefore some prime number will be found which measures the one before it, which also measures A. Therefore any composite number is measured by some prime number. Therefore, any composite number is measured by some prime number. *They might be considered both the formal and material cause of composite numbers, but this would be to say that the formal cause has produced something opposite to itself. To the extent that same and other mix, we might consider the possibility!